was an Indian painter who achieved recognition for his depiction of scenes from the epics of the Mahabharata and Ramayana. His paintings are considered to be among the best examples of the fusion of Indian traditions with the techniques of European academic art. Raja Ravi Varma is most remembered for his paintings of beautiful sari clad women, who were portrayed as very shapely and graceful. His exposure in the west came when he won the first prize in Vienna Art Exhibition in 1873. 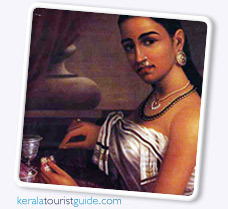 After a successful career as a painter, Raja Ravi Varma died in (1906) at the age of 58. He is generally considered as one among the greatest painters in the history of Indian art.